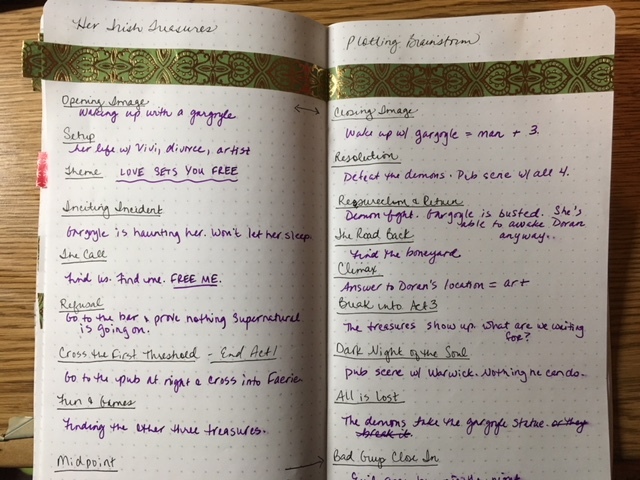 Continuing a series of posts about how I’ve been using the Tomoe River notebook for my writing, this time I’ll show how I plot at the highest level. I’m not the kind of writer that wants or even likes having every single scene listed out in gruesome detail. I really only need a roadmap to keep me on track. I need to know the main points – and I can capture enough to guide the story on two pages in my notebook. 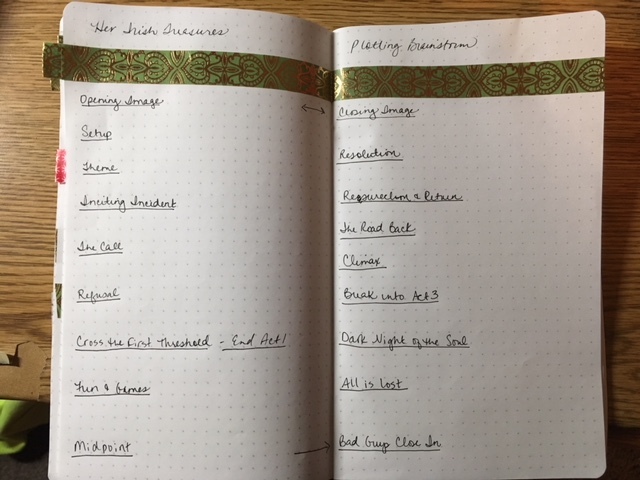 I use a combination of Blake Snyder’s Save the Cat and Vogler’s The Writer’s Journey for my plotting. I’m almost always thin in the middle – which is one reason the middle can take me a long time to get through. I try to have at least one major candybar scene for the midpoint that I really want to reach, and then after that, the rest is downhill. Sometimes a book will have a couple of candybar scenes. Sometimes I’ll be writing a book, and an entirely new, unexpected scene will rise up and demand my attention. That’s all great – that means the magic is working! Since I’m on a tight deadline for this story, I sat down and did this tonight. In less than an hour. So I really have no excuse not to do this every single time. I start with 18 bullet points, basically, on two sheets of paper. Some of them I don’t care about as much, but I write them down in case it sparks something later. The big MUST DO ones are: Inciting Incident, the Call, Crossing the Threshold, Midpoint, All is Lost, Climax, and Resolution. Anything beyond that is gravy on top. My favorite thing to do, though, is the opening and closing image. I love coming full circle. I love reflection. I love the words or thoughts a character have or say coming back in a new way at the end. So generally, this is how I plot. I know how the book opens. I use that image and flip it, so I know how the book ends. I figure out the inciting incident. What drives the beginning. I figure out what the ending is. What needs to happen to get to that final image. Then I fill in the spaces in between. Below are two images from my TN. One blank, and one filled in. Note: the one that’s filled in may give you spoilers to the novella I’m working on, so if you don’t like to know a complete high-level plot, skip that one! Though I kept it at a very high level. Hope this helps! The most important thing I hope you see is that you don’t have to have a ton of information figured out. I’ve only got a few sparse sentences for each of these bullets, but that’s PLENTY for me to write this novella and find the end without wandering around too much.